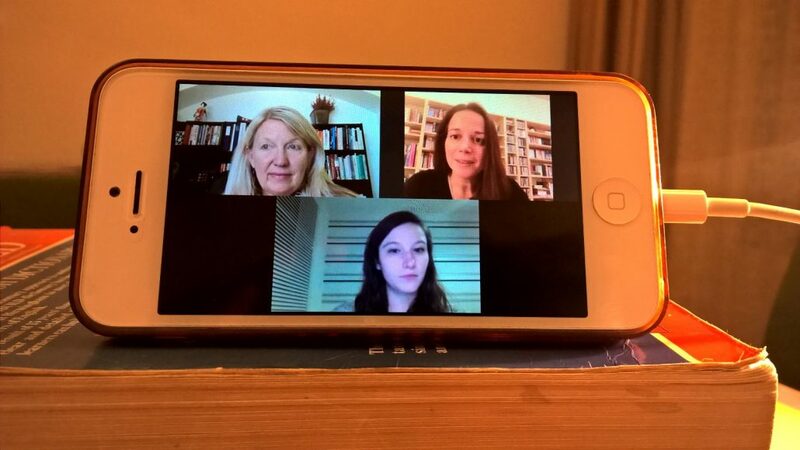 Last week I found out that you can actually mediate with an iPhone: I participated in an online mediation simulation with Virtual Mediation Lab and I played the mediator’s role connected with my iPhone. My experience with online mediation has been surprisingly good so far. The very technology that makes the online experience less “intimate” also enables a conversation that may never have taken place when the parties live on two different continents. What I miss most in online mediation is mutual and simultaneous eye contact. When you look into the camera you look the other person in the eyes but you can’t see their face. When you look at their face on the screen it looks like you are looking somewhere else. I’ve been wondering if I should train myself to just look at the camera so that the parties feel “looked at” but I’ve found out that I can’t go without looking at their facial expressions while we talk. It’s so important to spot a smile or a slight mood change when you can’t see how the parties interact in physical space. Another factor is that depending where you put or how you turn your laptop/smartphone/webcam your position looks different on the screen. So you might happen to appear as looking towards your left while the parties appear on the screen at your right. On the plus side, however, I think that it’s easier to perceive the mediator as a neutral party in online mediation as we are all “faces in a box on the screen”. A lot of subtle factors that may unconsciously influnce one’s perception like height, shape and the way you dress are just cut out. Another big plus to me is the ease of switching from joint sessions to individual sessions. Normally I would have to go in another room with one party and leave the other one waiting, which is usually done later in the session when a certain level of trust has been established. In online mediation it is possible to switch at a click and the other party is left to wait in the comfort of her own apartment. I found that this feature speeds up the process as it makes it possible to check in with the parties confidentially and adjust the conversation accordingly. Unfortunately the iPhone has a very small screen otherwise I could have also tried to see if it’s possible to write a memorandum of understanding at the end of the session with the on-screen keyboard. On the other hand the freedom of movement that the iPhone gave me proved very helpful, infact at one point I realized that my dinner was burning and I could just walk into the kitchen and turn off the oven while keeping the iPhone right in front of me without interrupting the conversation. Well, next time I know: Before entering the (virtual) mediation room it’s important to turn off every single device that could disturb the process!